I used to think simplicity meant doing bare minimum, but as I’ve gotten more relaxed and wiser in my old age (I just turned 30 you know), I’m realizing that simplicity is a beautiful thing. Take frozen pizza for example, it’s one of the most popular pre-made foods you’ll find in my freezer (especially during the summer time), and I can multitask the rest of the meal easily whenever I cook one. With summer upon us and our backyard ready to be enjoyed, I decided to host a simple pizza party with some of our close friends. I never realized how much I would come to appreciate the summer months until I moved to a true four-season state from sunny California. I’m pretty much dreaming of hot summer days throughout the winter months and now that we’re half-way through June, I feel it fading away so quickly. Does anyone else feel that way? Spending time outside as a family, swimming in the pool, playing lawn games, bubbles and making happy memories is the epitome of all things summer and I want it to last forever. Okay, this is me simplifying. As fun as my over-the-top parties that I usually feature on my blog are, they are a LOT of work and can sometimes be a bit intimidating. I can’t tell you how often I hear “This is so beautiful, but I don’t want to touch anything or mess it up.” As flattering as those comment are, it’s not the kick-back setting that I’d wanted for this style of party. Sometimes it’s just as much fun to have your friends over without all of the cutesy bunting, banners and color-coordinating candy bar. I’ve learned how having easy-to-make foods on hand, makes entertaining so much easier (on me). Which is why I try keep a freezer full of Red Baron Pizza on hand for such occasions. Did you know that Red Barron has been making timeless pizza for 40 years now!?! I just put that together when I clicked on their site and saw their throw-back style pictures everywhere (their marketing team is genius! ), I’m just happy to know it’ll be around for 40 more. Everyone agreed that the Brick Oven pizzas had the perfect crust, it’s not too thick and not too thin, with a satisfying crunch. One bite and the whole family will be asking for more! While the pizzas were in the ovens (yay for double ovens), I cut up some watermelon, made homemade lemonade and fruit purees. If you haven’t ever made your own lemonade it is so simple and it only takes about 5 minutes to make (20 minutes total with the fruit purees), which was the perfect thing to do while our pizzas cooked. In a large container, heat 1 cup of water in the microwave until boiling. Add in the sugar and whisk until fully dissolved, set aside. Using a fine mesh strainer, collect two cups of lemon juice. Add the lemon juice to the sugar water mixture, then pour it into the drink dispenser. Add lemon slices and chill the lemonade for 4-6 hours or serve on ice. For the pureed fruit, pulse each cup of fruit with 2 tbs sugar in a blender. If you want it chunkier puree, pulse it less. Garnish with the same fruit on top. This build-your-own fruity lemonade station was a big hit, even the kids got into it. 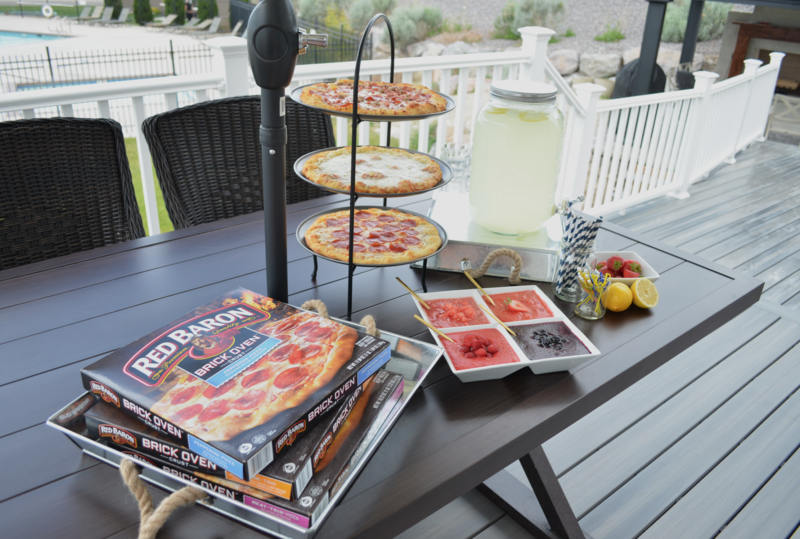 Guests were able to add a few tablespoons of fruit puree and the homemade lemonade to create the perfect beverage to go along with the pizza. I had paper straws, umbrellas and fresh strawberries available to use as garnishes. The choose-your-own adventure lemonade station was a big hit. I recieved a lot of compliments of the pizza and lemonade combination. So Yummy! After enjoying some food and visiting we were had everyone play a game of water balloon volleyball. If you haven’t ever played this game it is a blast. It’s also the type of lawn game that you probably already have everything on-hand needed to play. Each team will hold either side of a the beach towel. A water balloon placed on one side of the “net” will be launched over the net toward the other teams on the opposite side. Then the other side has to catch the water balloon in their towel and launch it back without it popping. One point is earned when balloons are popped on the opposite teams side. The trick to launching the balloons is to lift, tilt and pull the towel tight as you lift it up. To catch a balloons reverse that motion and once the water balloon hits your towel, allow the sides of the towel to fold in together. The little kids kept adding more and more water balloons into our towels, so there were more balloons in play. It makes the game more exciting and you’ll be catching balloons at a faster pace too. I love seeing our family and friends come together over the timeless pizza. 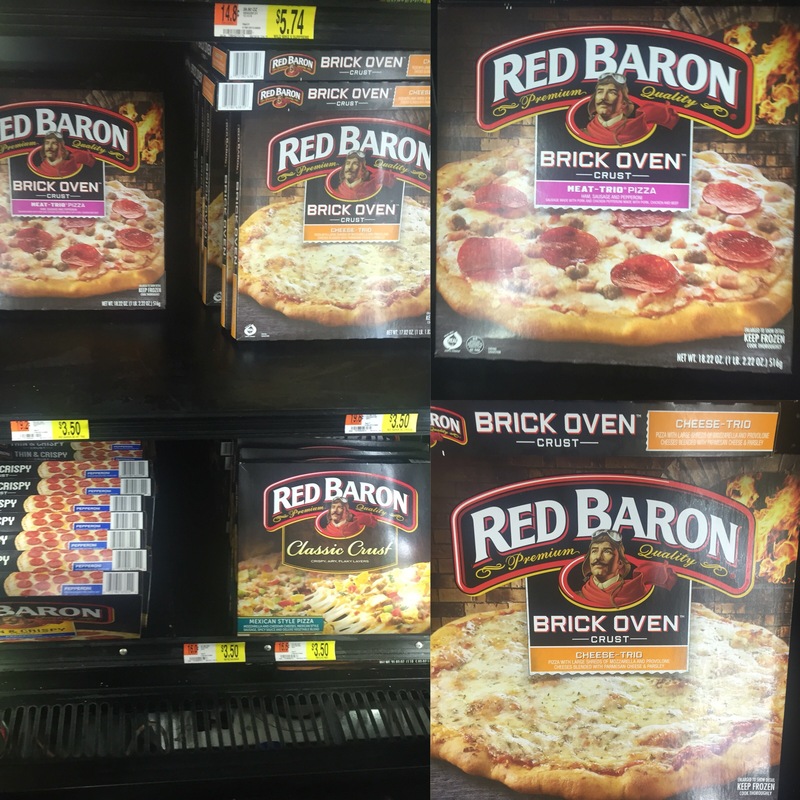 You can find these Red Baron Pizzas and many other flavors at your local Walmart in the frozen food section. Make sure to use this Ibotta coupon to save on your purchase too. What is your favorite way to have a simplified summer party?